Your wedding ceremony, officiated to your specifications. $175.00 + expenses for travel or hotel stay. One night for a "no rehearsal" ceremony and "two night stay" for "rehearsal and wedding" ceremony. This overnight accommodation clause applies to weddings 35 miles and above from my home in Vestavia, Al. Since driving back and forth for rehearsal and ceremony can be costly. One night for a "no rehearsal" ceremony and "two night stay" for "rehearsal and wedding" ceremony. This overnight accommodation clause applies to weddings 35 miles and above from my home in Vestavia Hills, AL. I have been a minister of the gospel since 1992 - traveling and preaching when and where needed or asked! 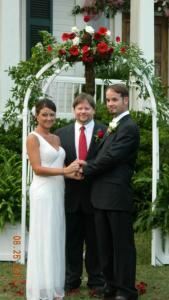 I have officiated over 60 weddings and love to see couples unite in love and matrimony! The bible declares whoever finds a wife, finds a "good" thing! I believe that to be true! My dad taught me years ago, that when God created a woman, He took a part of a man, not from his feet to be trampled by him, nor from his head to rule over him, but from his side (a rib), that she would be his equal, from under his arm that she would have his strength and protection, and near his heart that she would have his love. I believe this with all my heart and practice it daily! :) Your wedding would include the rehersal, the wedding ceremony performing either single or two ring ceremony, and a one time pre-maritial session with Bro. Hayes at least a week prior to the ceremony. There is a cancellation policy of at lease 7 days prior to the wedding to be refunded of the deposit. This package is valid only in and around the Birmingham, Alabama area, unless the purchaser agrees to pay for room/travel expenses outside the 50 mile range of the Birmingham area. The method of payment accepted for the balance of the package is via PayPal. The date when the payment is due is the day of the services are rendered. Special offers and discounts may be applied if total of package is paid in full 7 days prior to the event. A discount of 15% will be applied.